At least 222 people were killed by the tsunami, which swamped hotels, houses and concertgoers at a beachside venue in the Southeast Asian nation. The pope also appealed for people to show solidarity, and for the international community to lend support, for those affected by the disaster. Indonesia's disaster management agency says the death toll from a tsunami believed to be triggered by a volcanic eruption has climbed to 222, with 843 others injured and 28 missing. The volcano that erupted Saturday night lies in the Sunda Strait between Java and Sumatra islands, linking the Indian Ocean and Java Sea. It erupted about 24 minutes before the tsunami, according to Indonesia's geophysics agency. Scientists said Sunday that the tsunami could have been caused by undersea landslides or those occurring above sea level on the volcano's steep outside slope following the eruption. 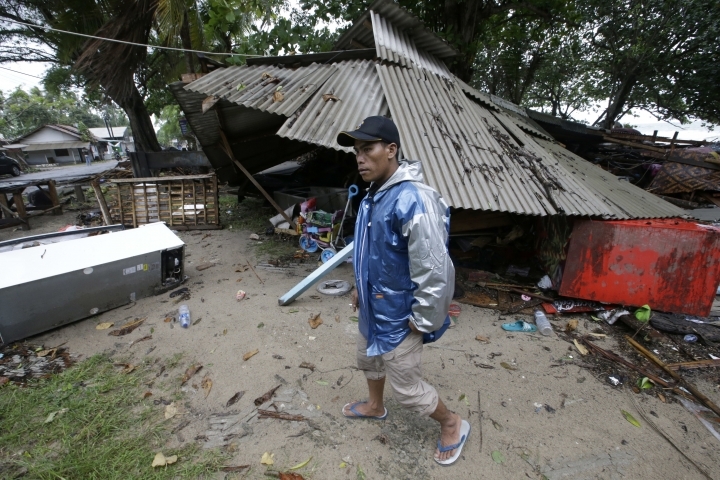 Indonesia's disaster management agency says the Saturday evening tsunami has left at least 168 dead, 745 injured and 30 missing. The worst affected area was the Pandeglang region of Banten province in Java, which encompasses the Ujung Kulon National Park and popular beaches southwest of the capital, Jakarta. Scientists say the tsunami was probably caused by the eruption of Anak Krakatau, a volcanic island formed over years from the nearby Krakatau volcano. They also cited tidal waves caused by the full moon. 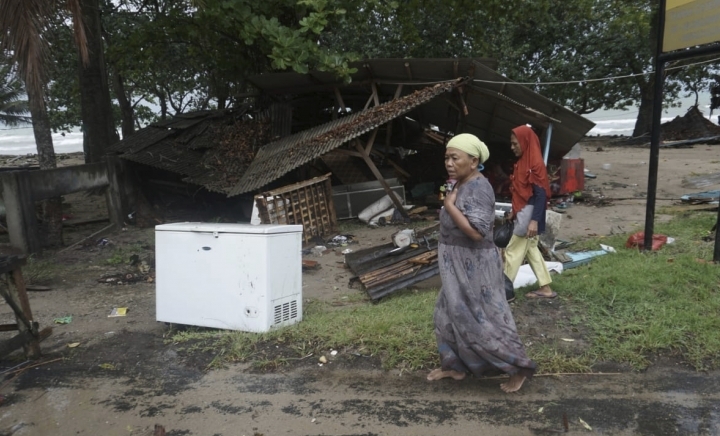 Australia and New Zealand say they have no information their citizens were among victims of a tsunami that killed at least 62 people around Indonesia's Sunda Strait. Australian Prime Minister Scott Morrison told reporters on Sunday, "We understand that at present there are no foreigners, let alone Australians, who have been impacted by this." A spokesperson for Australia's Department of Foreign Affairs and Trade says the Australian Embassy in Jakarta is continuing to make "urgent inquiries" to determine whether any Australians were affected. New Zealand's Ministry of Foreign Affairs and Trade says 299 New Zealanders are registered as being in Indonesia. A spokesperson says the New Zealand Embassy in Jakarta is in touch with local authorities. A spokesman for Indonesia's disaster management agency says at least 62 people have died and 20 are still missing after a tsunami apparently triggered by a volcanic eruption swept away beachfront houses and hotels in western Indonesia. Footage posted on social media showed a pop band named "Seventeen" performing under a tent on a beach as dozens of people sat listening at tables. Then, in between songs with the drummer pounding, the stage suddenly heaved forward, throwing the band and all their equipment into the audience. The worst affected area is the Pandeglang region of Banten province in Java, which encompasses the Ujung Kulon National Park and popular beaches. In the city of Bandar Lampung on southern Sumatra, hundreds of residents took refuge at the governor's office. 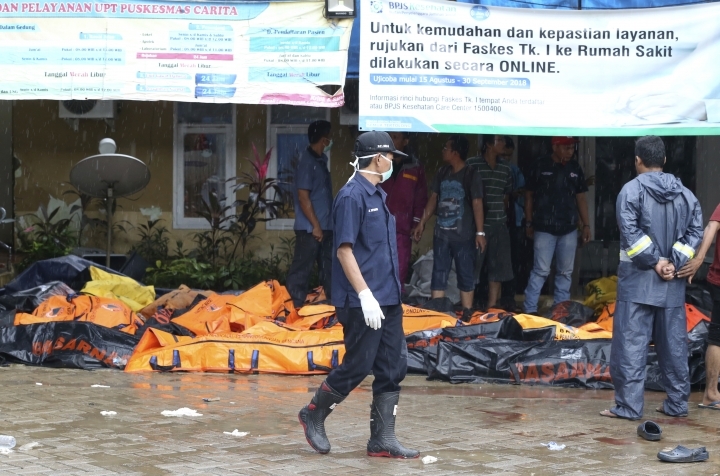 Indonesia's disaster management agency says the death toll from a tsunami apparently caused by undersea landslides from a volcanic eruption has risen to 43 with some 600 injured. A man who says he and his family survived the tsunami that hit the coast around Indonesia's Sunda Strait says he was taking pictures of a volcano Saturday night when he suddenly saw a big wave come toward him. "I had to run, as the wave passed the beach and landed 15-20m (meters) inland," Oystein Lund Andersen writes on Facebook. "Next wave entered the hotel area where i was staying and downed cars on the road behind it. Managed to evacuate with my family to higher ground trough forest paths and villages, where we are taken care of (by) the locals. Were unharmed, thankfully." "So encountered my first tsunami it seems, hopefully my last," Anderson writes. Government officials say that at least 20 people were killed after a tsunami hit the coast around Indonesia's Sunda Strait, the BBC reports.